Over the years, humans have been fascinated with dolphins. From stories about interactions between humans and dolphins to the chance to swim with dolphins in Mexico thanks to places like Delphinus. 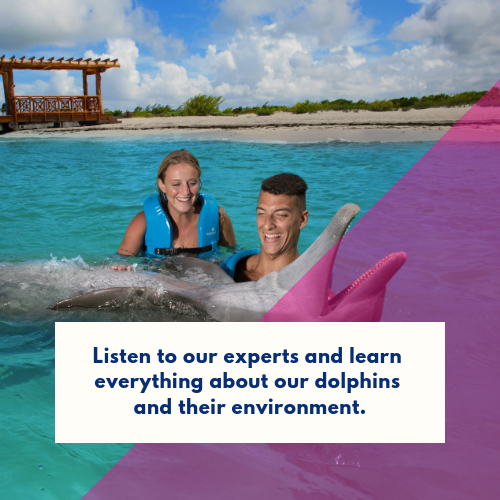 In Delphinus, we help make your dream come true: swim with dolphins in Riviera Maya, always under the supervision of the animal care specialist who guarantees the dolphin's comfort, as well as your safety. Get ready! Today we share some tips with you to make sure your swim with dolphins in Riviera Maya is an unforgettable experience. The Delphinus animal care specialists are very skilled and know everything about the physiology, habits and behavior of dolphins. They are always keen to share their knowledge with you, we recommend that you be open to learning more in order for your swim with dolphins in Riviera Maya to be truly unforgettable. Remember that this kind of experience is very emotional but is also a source of adrenalin and a physical activity. Even though you don’t have to be an Olympic swimmer to enjoy the dolphin interaction program, you certainly do have to feel comfortable enough in the water to swim on your own. 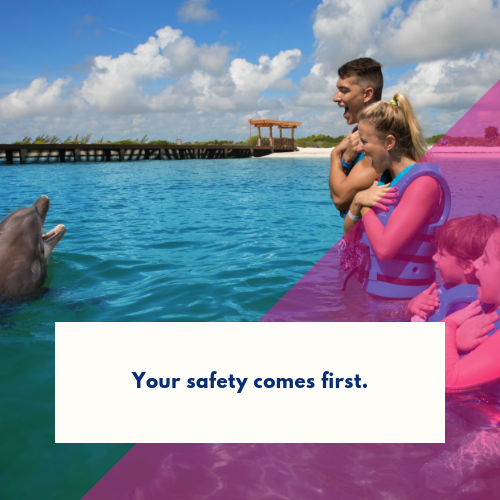 Either way, Delphinus provides you with a lifejacket that, by law, all visitors are required to use to ensure a more comfortable and safe experience. 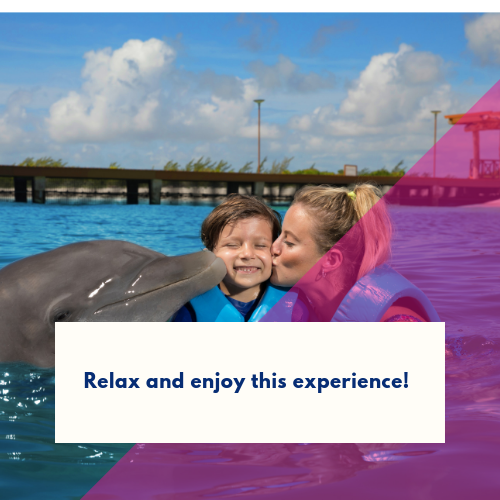 If you are pregnant or suffer from heart or back problems, you can also live this incredible experience and swim with dolphins in Mexico, although, for your own safety, you will not be able to perform certain activities, such as the foot push. Dolphins have a very sensitive skin. 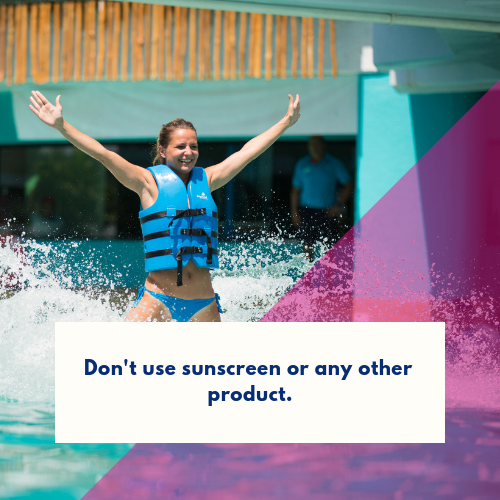 Don’t use sunscreen, oils or perfumes during your swim with dolphins in Mexico because you could irritate their skin. In the same way, electronic devices, jewelry or any other accessories are to be left in the lockers. This is to avoid causing any damage to the most sensitive parts of their body like the eyes, nose or snout. TIP: it is recommended that women wear a one-piece swimsuit during their dolphin interaction program, this way you will feel more comfortable and be able to do the activities without having to worry about anything else. This is your opportunity to interact with dolphins!In Delphinus, the experts are constantly watching over you and the dolphins. You can hug them, kiss them and even go for a ride with them, and be confident that both you and the dolphin will have a great time. What are you waiting for? Book now and swim with dolphins in Mexico!